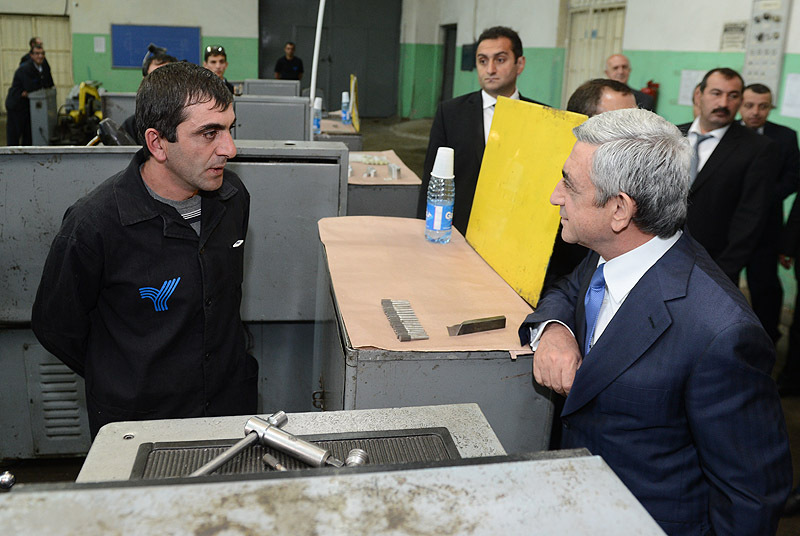 President Serzh Sargsyan, who is in Syunik on a working visit, in the framework of his visit familiarized with works of small and medium enterprises which are carrying out their development programs side by side with Syunik’s major mining and energy companies, looked into the investment projects, and prospects of development. 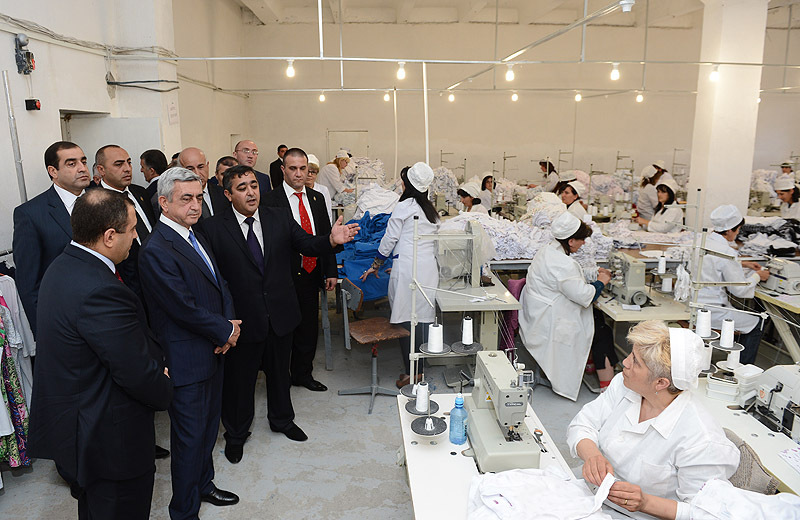 In particular, the President visited Aval Trade knitting enterprise in Sisian, which was established in December 2012 and since April 2013 has been manufacturing knitting production. 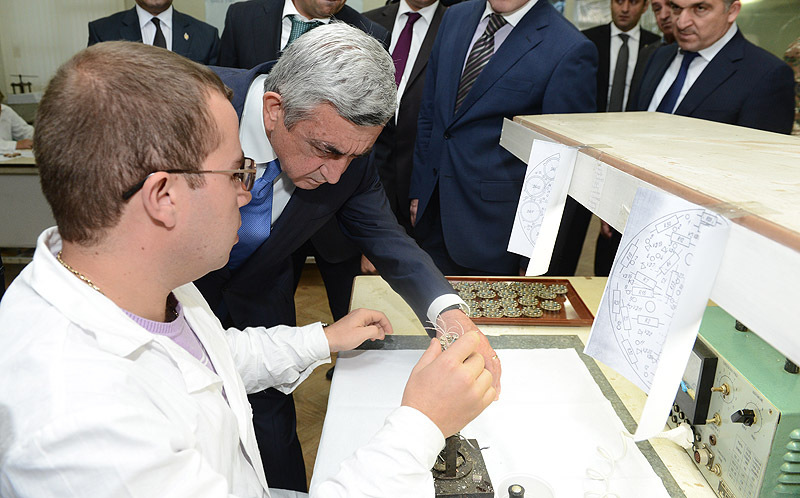 The President was informed that in four months of this year, the company has made an investment of 30.0 million AMD, including the import of modern machinery. 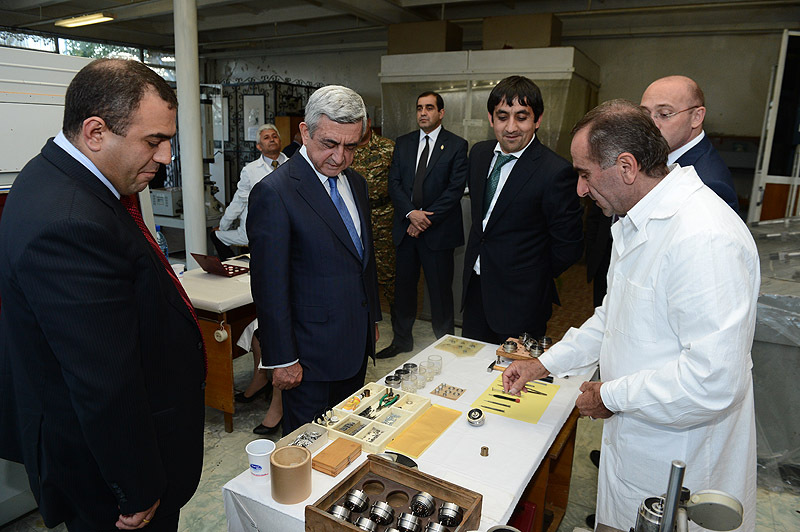 The enterprise employs 90 people with the average monthly salary of 70-80 thousand drams. 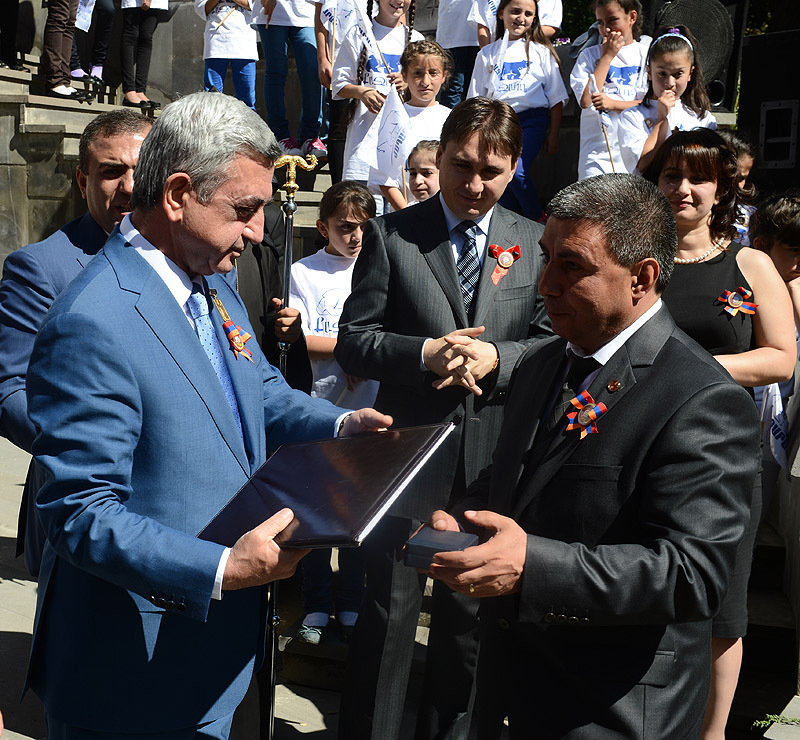 As of April-August 2013, according to the management the company manufactured nearly 70.7 million dram worth production which was sold in the Russian Federation. 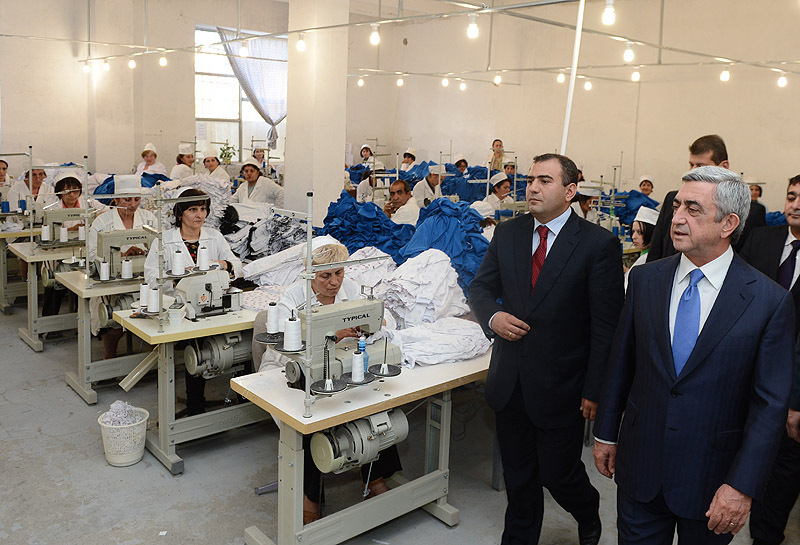 The company is planning to expand its export market by increasing production capacities which will allow to employ 120 people. 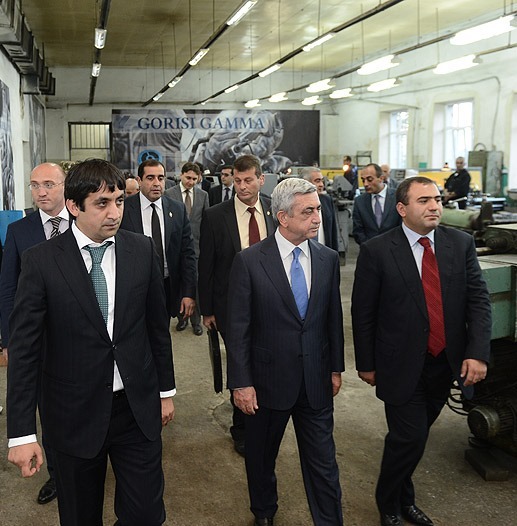 In Goris, the President visited Goris Gamma enterprise which together with Zangezur copper and molybdenum factory currently is executing a new program of manufacturing new machinery in full compliance with international standards. 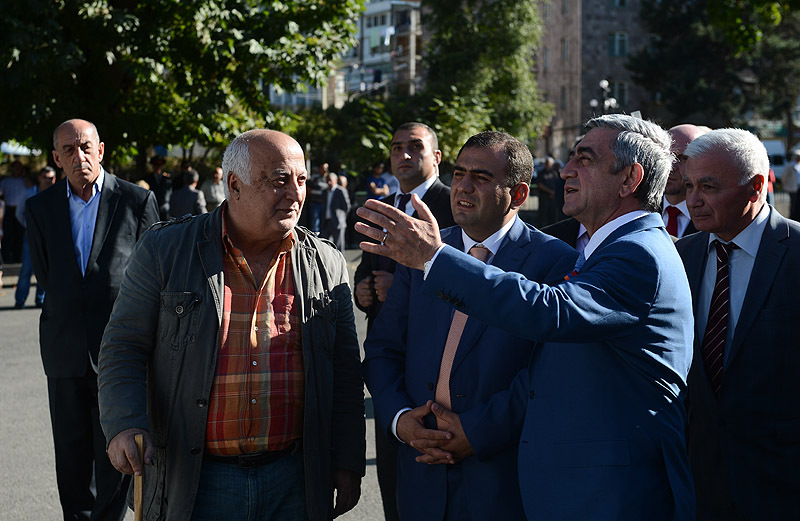 Representatives of the company noted that they have concluded negotiations with the German supplier and now are negotiating with potential customers to specify the demand and assortment volumes. 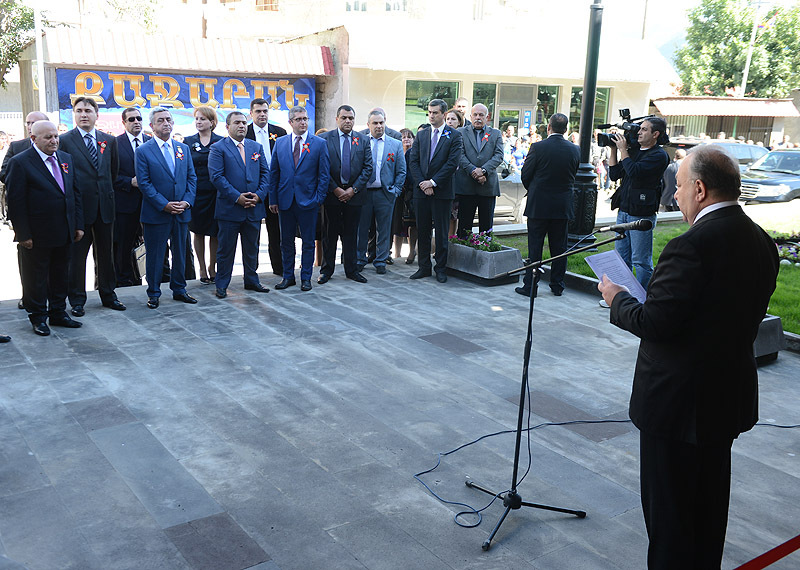 It was noted that if the program is successful, Armenia will be manufacturing digital, high accuracy turning and milling machines which comply with the European standards. 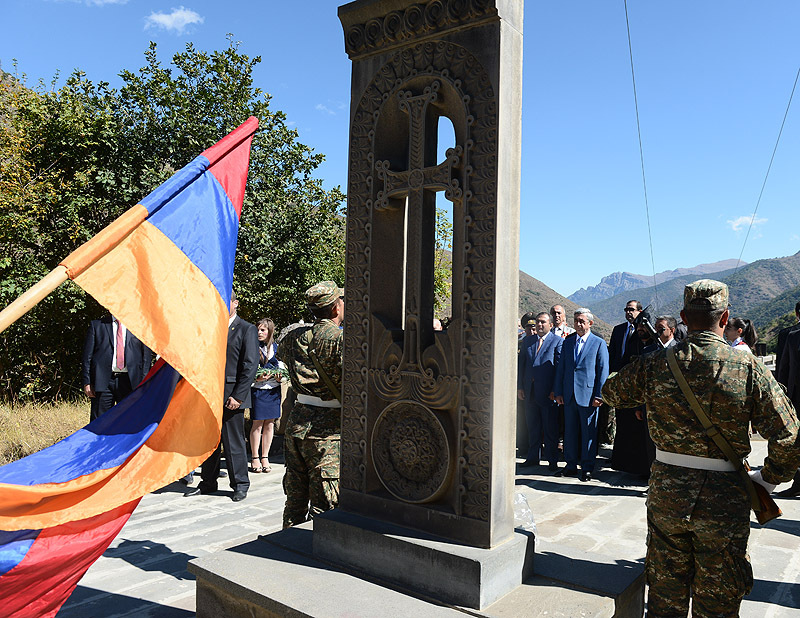 At the initial stage of the program, investments reached one million US dollars; if there is proper demand, along with the increase of the production capacities, the number of jobs will reach 130. 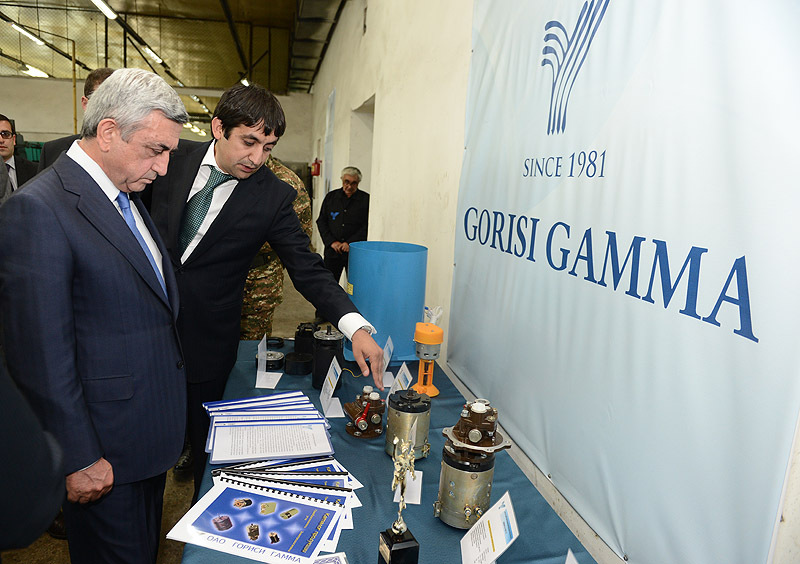 Goris Gamma enterprise was founded back in 1979 and was specializing in the production of special machinery for the military industrial complex of the Ministry of Defense of former USSR. In 1996, the enterprise was restructured becoming a closed venture; 20 percent of its state shares were given without indemnity to the employees and 80 percent were privatized in 2001. Currently the enterprise has mechanical, special machinery assembling, electromotor assembling, and optical production units as well as an experimental laboratory. 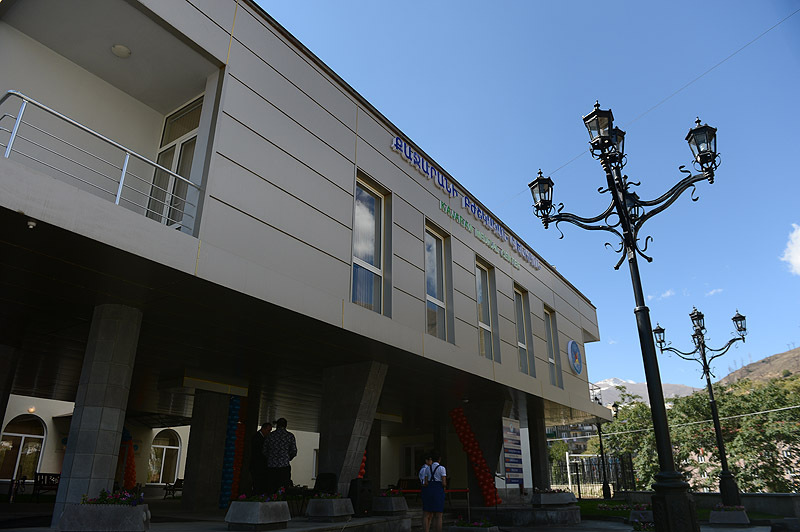 The production of the company is being sold primarily in the Russian Federation and, according to the management there are also sales orders from Canada. In January-August, 2013 the company manufactured 238.0 million dram worth production which is a 23% increase compared to the same period last year. It was noted that along with the batch production, the Company also receives sales orders from the Zangezur copper and molybdenum factory such as manufacturing of tools and machinery. 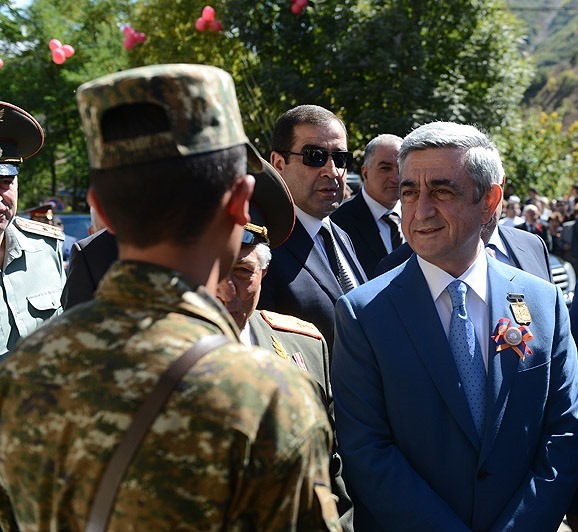 In the framework of his visit, President Serzh Sargsyan visited also Qajaran town. 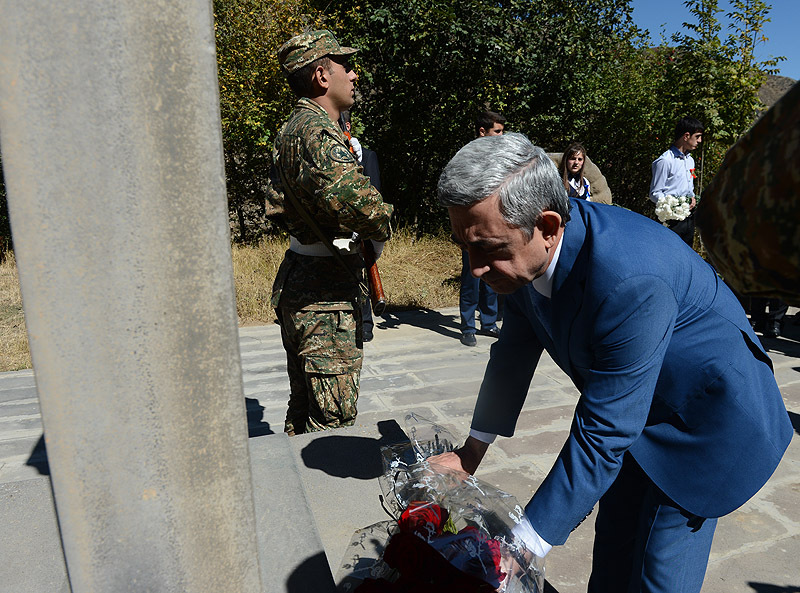 First, he visited the monument dedicated to the fallen heroes, laid flowers and paid tribute to the memory of the sons of the Armenian nation who died for our Motherland. 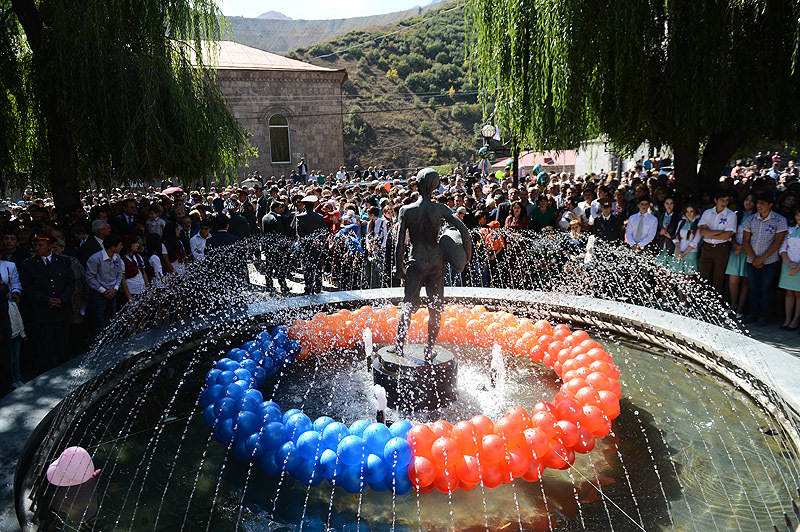 Later, at the central square of Qajaran, the President participated in the events dedicated to the 55th anniversary of the town and in the framework of the event handed awards and letters of commendation to a group of individuals who were distinguished for their patriotic work in different areas: Hrachia Tadevossian, Head of Division in the Qajaran Medical Center, Ltd. outpatient clinic by the Presidential decree was awarded the Mkhitar Heratsi Medal; Mikhail Aroustamian, Executive Director of the Rivs scientific and production enterprise (RF) was awarded the Anania Shirakatsi medal. 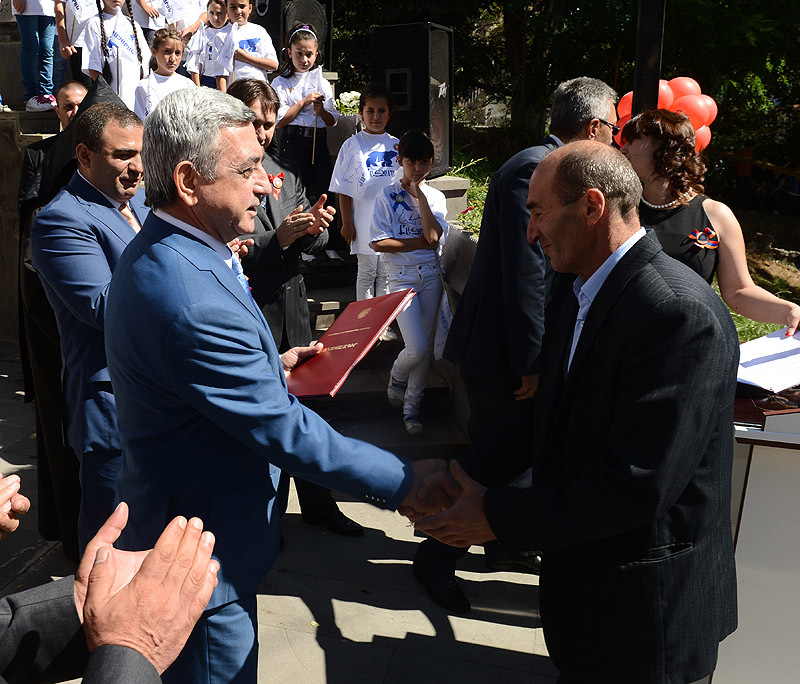 Saro Hayrapetian, Chief Architect of the Qajaran community communal services Ltd. and Zakhar Mirzoyan, electric welder of the Ore Reduction and Transportation unit of the Qajaran copper and molybdenum factory for their years-long and diligent work received Presidential letters of commendation. 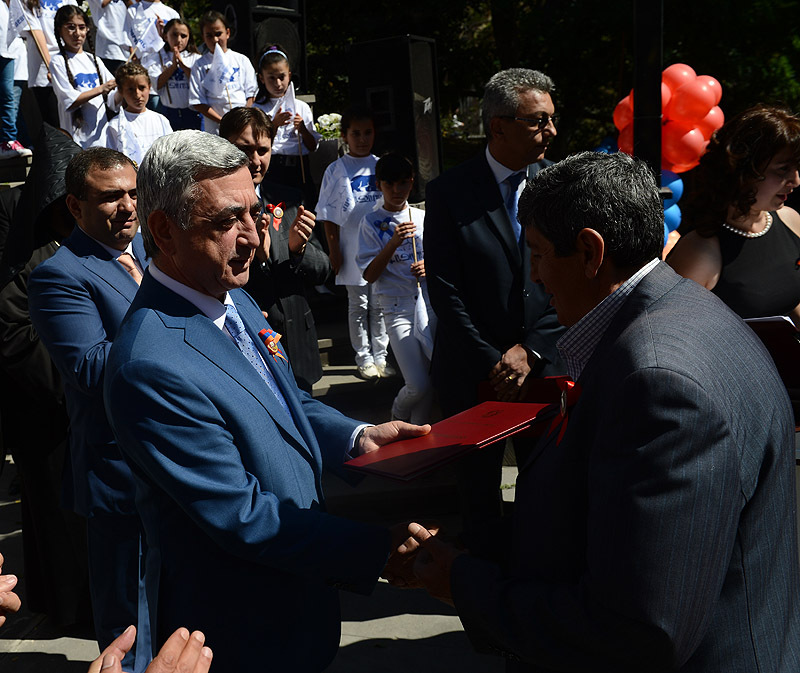 In Qajaran, by the decision of the Council of Elders, the President was handed the first Battle of Artsakh commemorative medal. 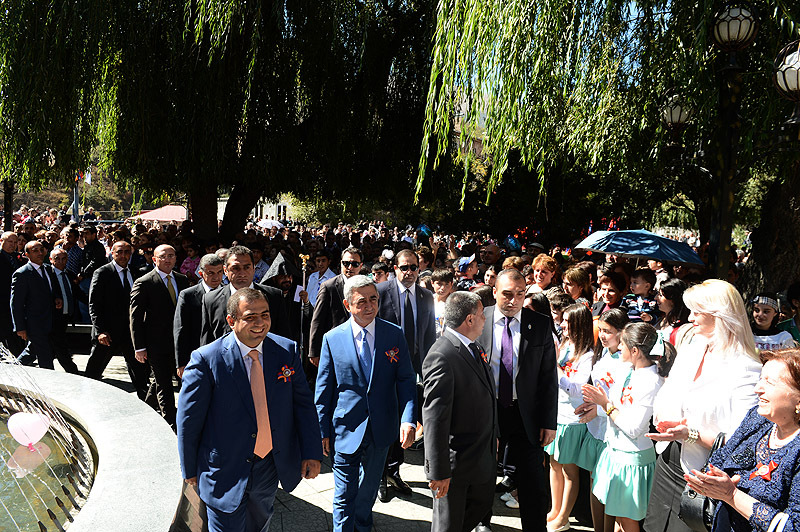 President Sargsyan congratulated all those persent on the occasion of the town’s holiday and on receiving awards, thanked the inhabitants of Qajaran for their daily efforts aimed at the development of their town and their dedication, wished all the best and assured that Qajaran and other settlements in our country every year will become more comfortable and developed. 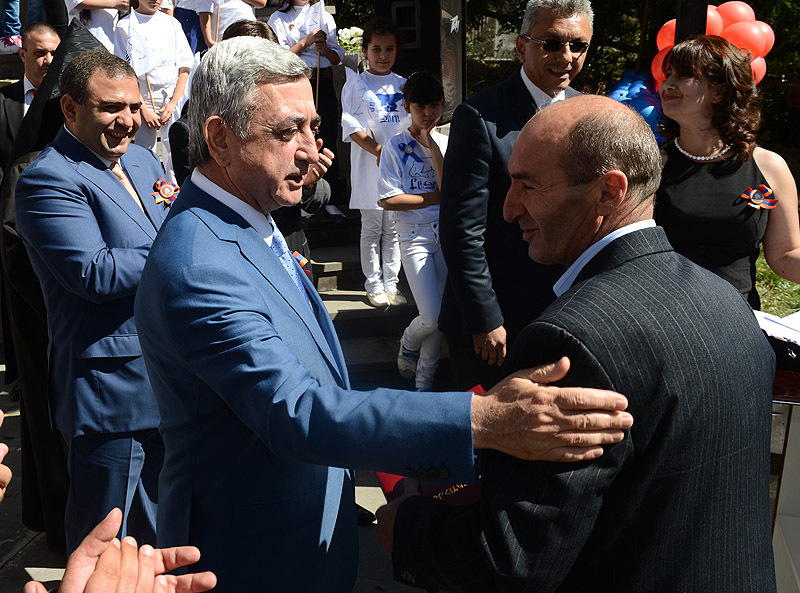 The President of Armenia urged the participants of the festivities to look at the future of their town and our country with optimism and faith. 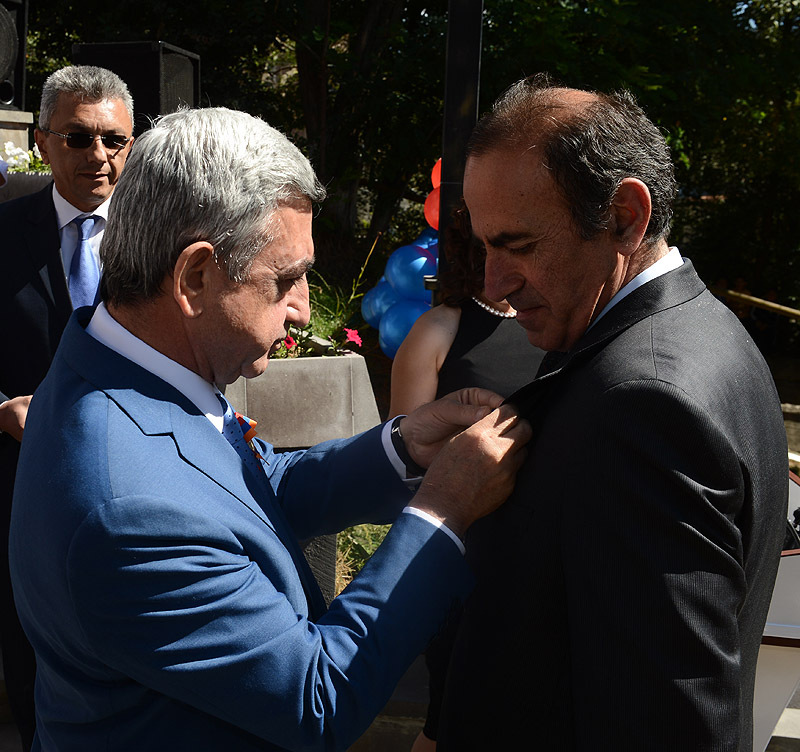 At the conclusion of the festivities, Serzh Sargsyan attended the opening ceremony of the monument dedicated to the former director of many years of the Qajaran copper and molybdenum factory, a skillful organizer of the mining production Frunze Petrossian. 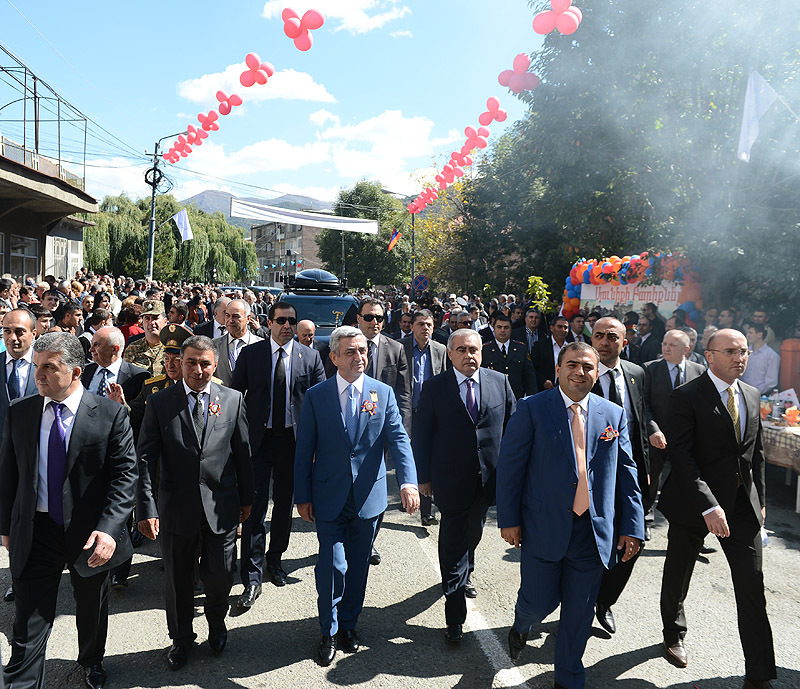 The President participated at the opening ceremony of the reconstructed and modernized Medical Center of Qajaran, visited the Garegin Nzhdeh Square in Kapan, where during the tour the familiarized with the program of renovation of the Square, and in high school n. 2 in Kapan he observed constructions works conducted there. 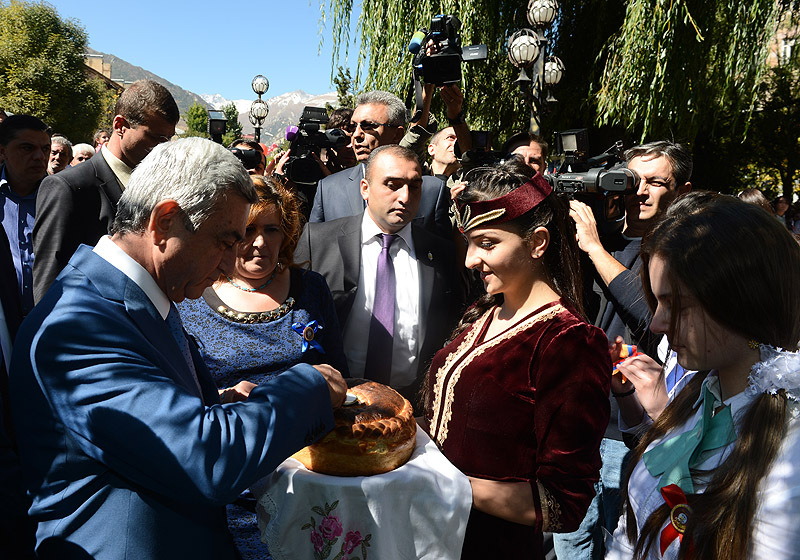 In Syunik community of the marz, Serzh Sargsyan visited the newly constructed small cattle slaughterhouse and processing production unit. 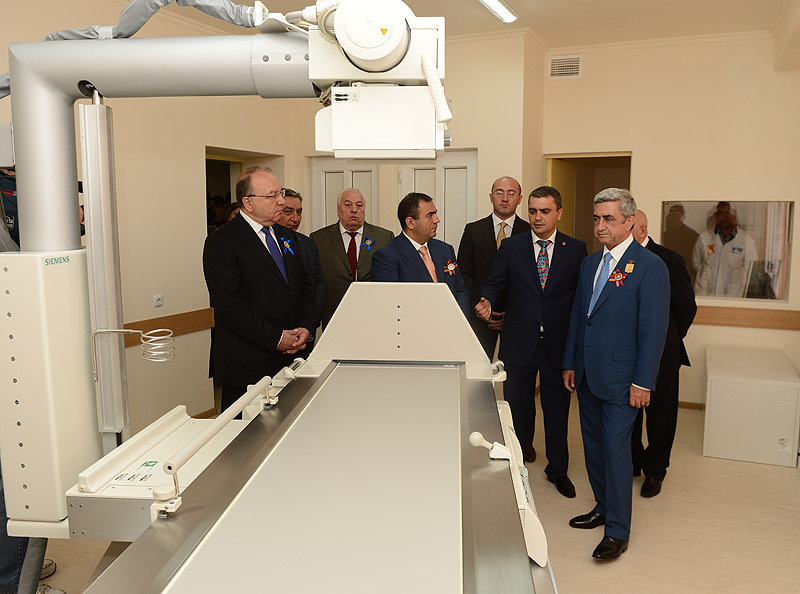 The Medical Center of Qajaran, whose modernization commenced in August 2011, according to the responsible officials, is equipped with modern medical devices. 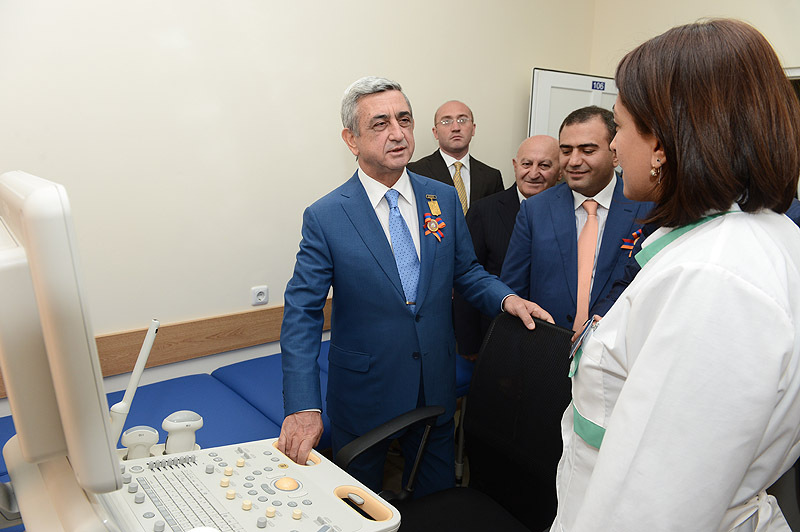 Surgical rooms are fully equipped with all necessary apparatus. 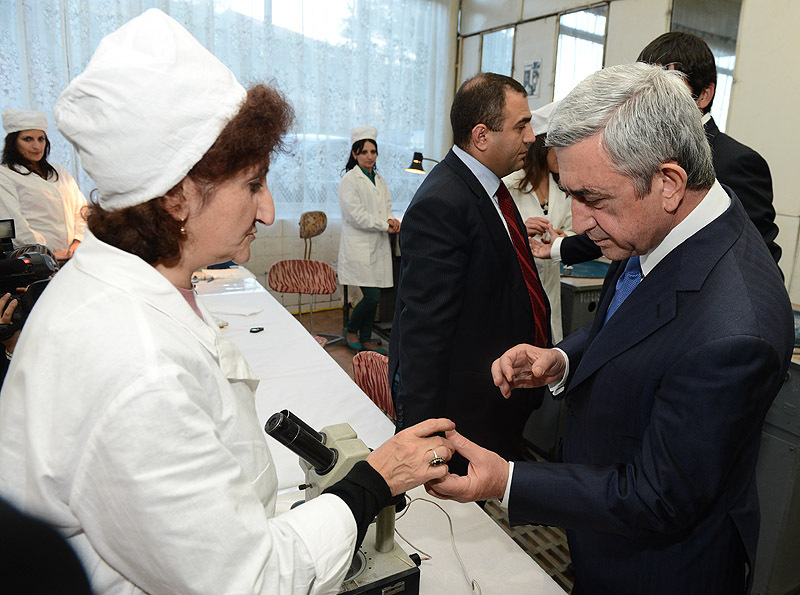 The Center has all necessary furniture and medical utensils. 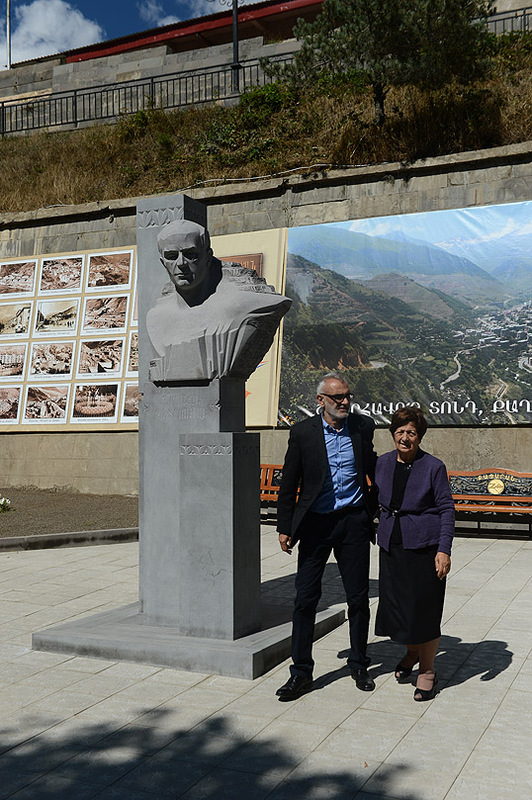 With regard to the renovation project of the Garegin Nzhdeh Square in Kapan, the President was informed that all excavation works have already been concluded and the expenditure papers are being prepared. 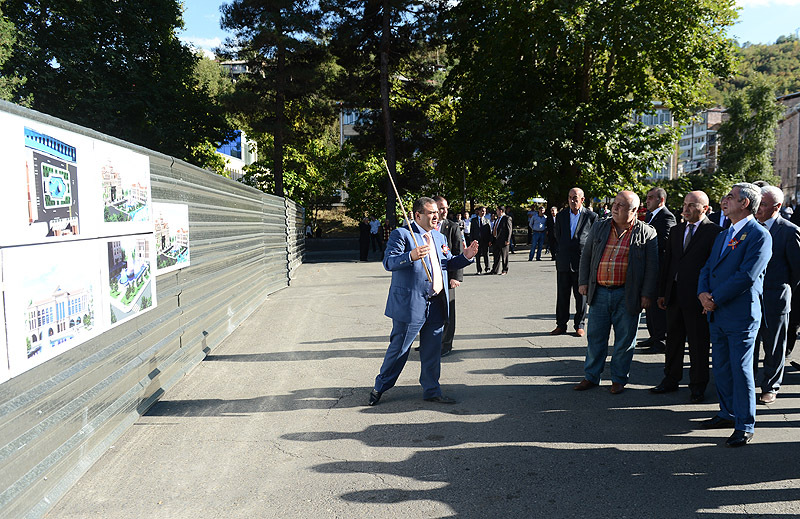 The program envisages the reconstruction of the facade of the Cultural Home, renovation of the pool, repair and installation of illumination effects matching the musical background, construction of a recreation zone next to the pool, as well as clean-up of the basin of Vachgan river which is running in the vicinity of the park. 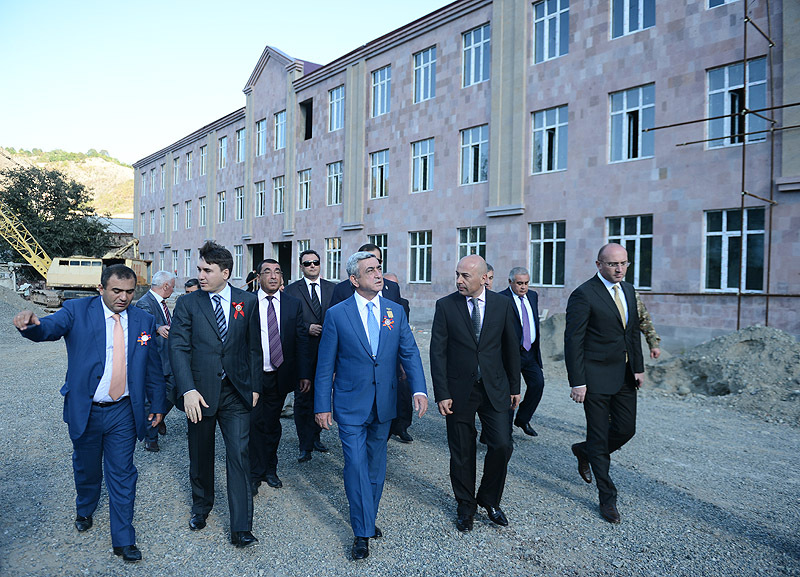 Construction works at the high school n. 2 in Kapan, which are conducted in the framework of the Construction of Educational Objects program adopted by the decision of the RA government in 2011, commenced in September 2011. 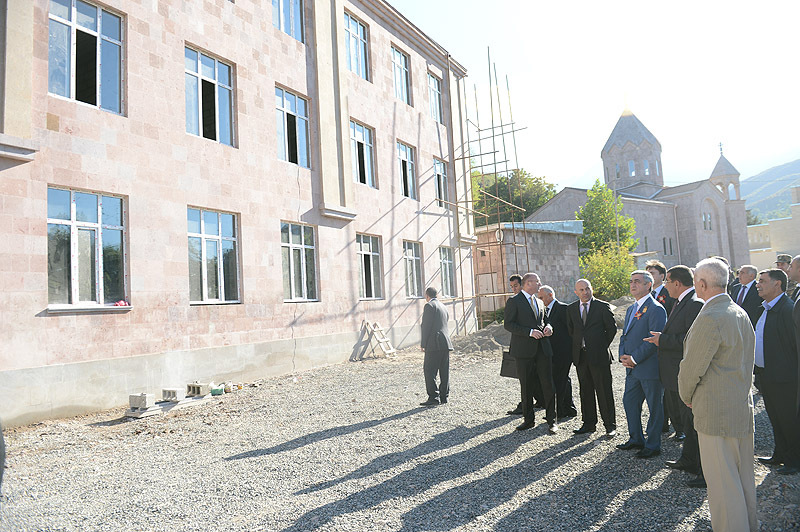 The President was briefed that in December 2013 concluded will be works related to the roofing, installation of doors and windows, internal heating and sewage systems, fixing of the preparatory layer for floors and interior design works. 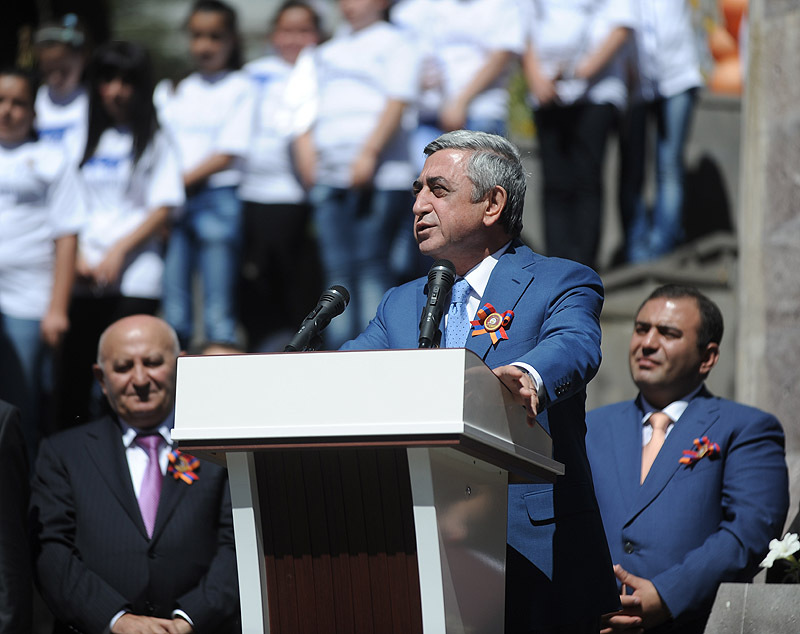 For the completion of the construction works, the RA state budget 2014 will allocate 204.0 million AMD. 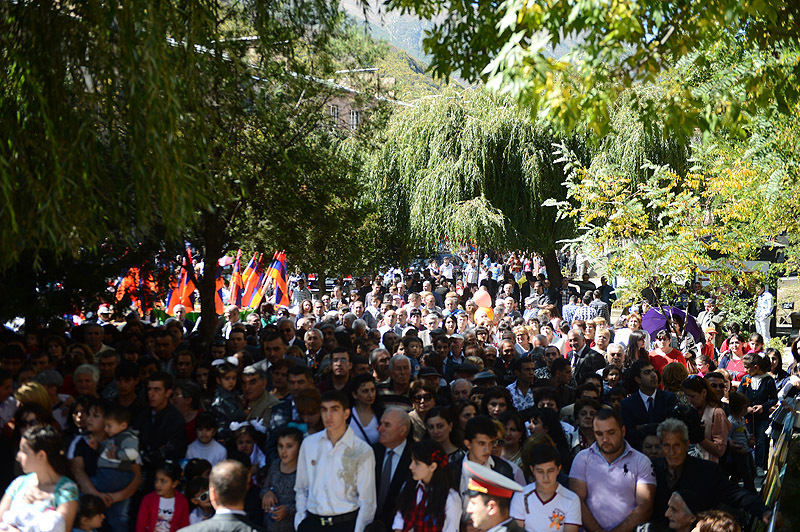 It was also noted that currently the academic process of the school is being organized in other schools of the town. 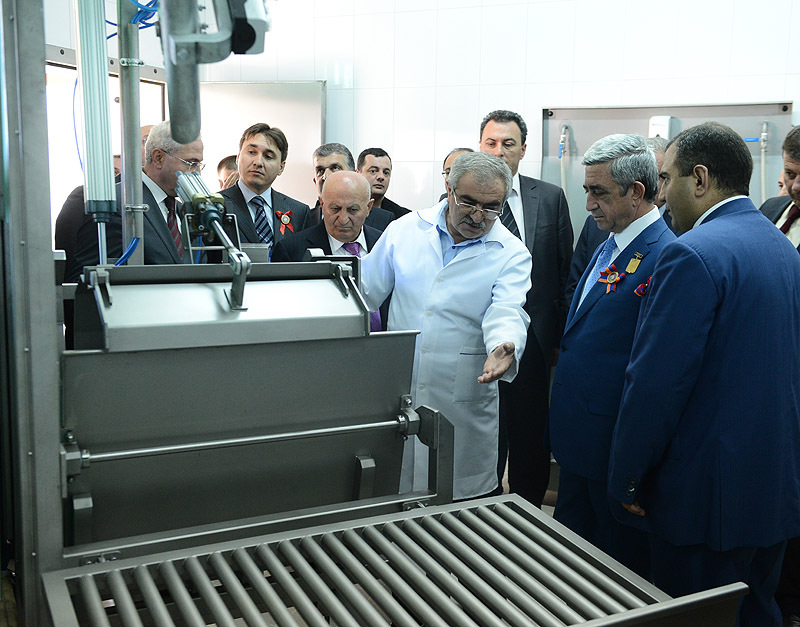 In the framework of his working visit, the President of Armenia visited also the newly constructed small cattle slaughterhouse and processing production unit in Syunik community. 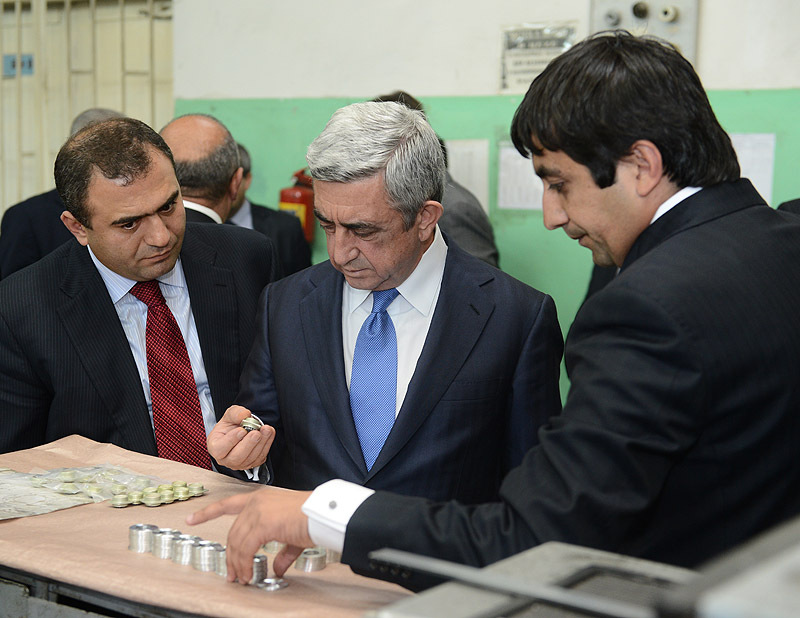 He familiarized with the investment and production development programs. 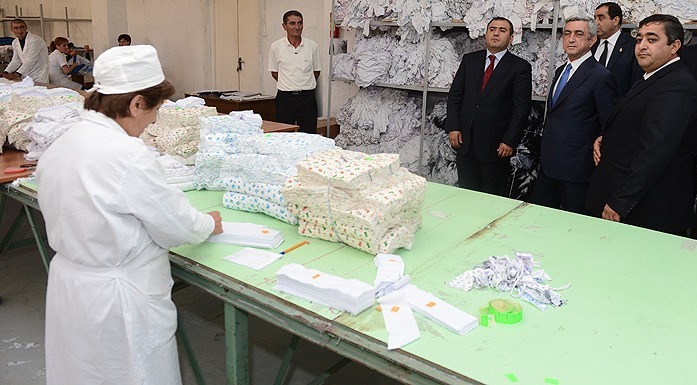 The production unit which was built in 212-2013, according to the responsible officials, will allow to conduct the stacking, slaughtering and keeping processes in accordance with contemporary methods. 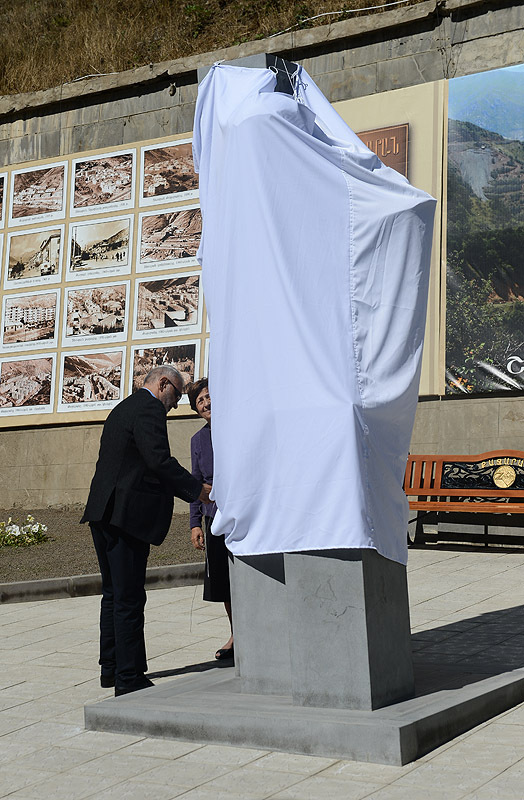 The production is to be exported to the Islamic Republic of Iran. 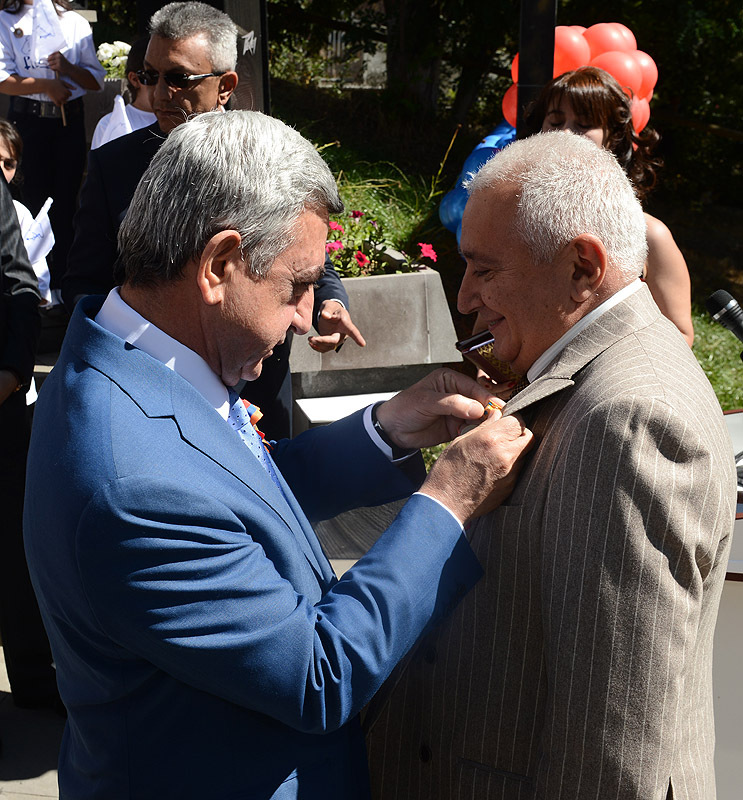 The enterprise hires 43 employees with the average monthly salary of 180.000 AMD. 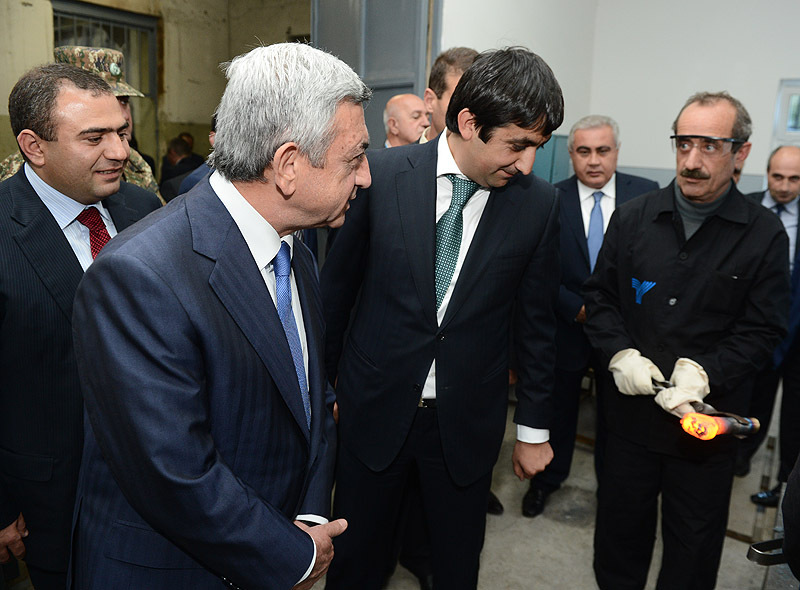 Along with the increase of the production capacities, it is planned to bring the number of employees up to 75. 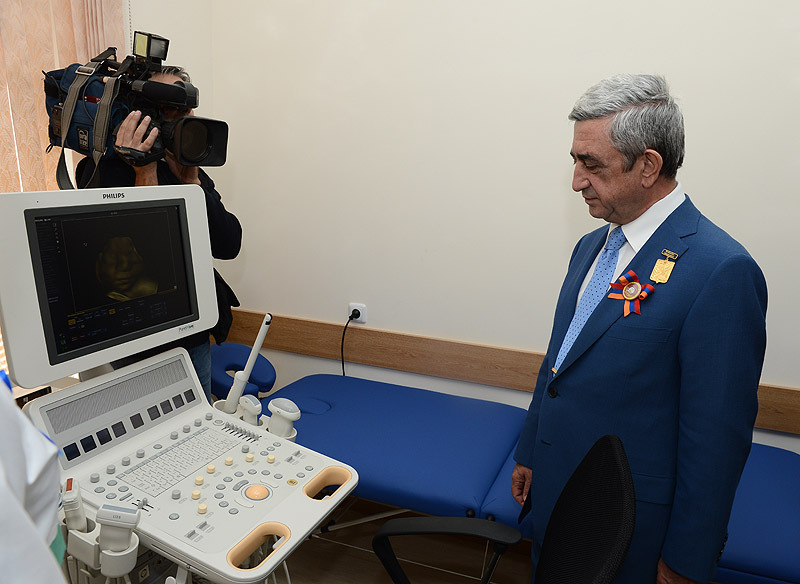 It was noted that the functioning of the enterprise is important not only from the viewpoint of creating new jobs but will also serve as a serious impetus in the marz and in the entire Republic for breeding small cattle.